Lake Erie is the fourth-largest Great Lake and the world’s twelfth largest freshwater lake. Erie is about 210 miles long, 57 miles wide and about 570 feet above sea level. Bordered by Michigan, Ohio, Pennsylvania, New York and Ontario, Lake Erie has 856 miles of shoreline, giving it a surface area of just over 9,900 square miles — slightly larger than the state of Vermont. Its name comes from the Erie (“People of the Panther”) nation of American Indians who once inhabited its southern shores. Though the lake bottoms out at 210 feet, it averages only 62 feet deep. 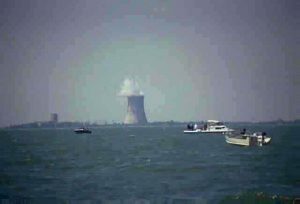 Because of its saucer-like shallowness, Lake Erie has a reputation among sailors of being quick to “kick up her heels,” raising waves of frightening size in even a modest gale. Erie may well be the most used, most enjoyed and perhaps even the most loved lake of the five. Erie forms part of the top of the U.S. “industrial crescent” — the majority of U.S. and Canadian cars are made in this region, and it is a principal steel-producing area. It also supports the second-largest sport fishery on the Great Lakes today (Lake Michigan’s is first), and its walleye fishery is generally considered to be one of the best in the world. Erie’s water quality problems were legend during the environmental movement of the late 1960s, when this “dead” Great Lake became a national symbol of the effects of pollution and neglect. Fortunately, Lake Erie’s flushing time is less than three years — the shortest of all the Great Lakes — and the lake has been the quickest to respond to U.S. and Canadian efforts to improve waste treatment and reduce pollution of the lakes. 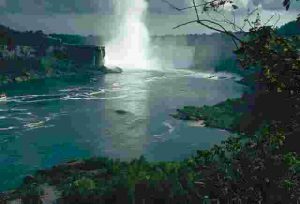 At Erie’s eastern tip, near Buffalo, N.Y., its water flows north into the Niagara River, racing downstream at 750,000 gallons per second. In a 35-mile stretch between Lake Erie and Lake Ontario, the river elevation drops 326 feet, nearly 200 feet of it all at once — at Niagara Falls, one of North America’s most famous geographic features and one of the natural wonders of the world. A few miles west of Niagara Falls lies the Welland Canal, some say one of the most impressive man-made structures in the Great Lakes region. Operated by Canada, the 26-mile-long canal contains eight locks that lower and lift cargo ships around the falls. After the falls, the rampaging river again swings east and empties into Lake Ontario, the last of the five Great Lakes.